Beware when the great God lets loose a thinker on the planet. It was a pretty good pie. Students across the northeast were familiar with the pies sold by the Frisbe Baking Company. Affordable, tasty, and readily available, they were a staple in colleges throughout New England. And to top it off, when the pie was gone, the pie plate was a lot of fun to toss around with friends. One day, a fellow named Walter was tossing one of the pie plates with his wife. An onlooker saw how much fun they were having and offered them 25¢ for the plate. A business indeed! 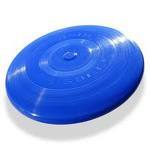 Millions of sales later, the Frisbee is a cultural icon. The tale of the Frisbee is actually a thinker’s story from beginning to end. Initially, someone saw the Frisbe Pie plate as something other than a plate. They saw it as a toy, a flying pie, a flying saucer. Walter saw it as an opportunity. He was looking at the same thing everyone else was looking at, but he saw something different. He saw a business. John Maxwell, in his great book Thinking For A Change talks about the concept of Creative Thinking and how it challenges the status quo. And that is the secret.Successful people think differently than others. They consider options. They consider ideas others might think are crazy. They don’t limit their thinking. There are several ways to help stimulate creative thinking. Always be ready to jot down a note. Keep a pad of paper close by, in the car, on your desk or wherever you are. Or use your IPhone or Blackberry or a voice recorder or write on your shirt cuff. But be sure you can capture thoughts and ideas as they occur to you. If you think it – write it! Don’t limit yourself. Brainstorm as many options as possible. Keep a pad of sticky notes close by. Jot down ideas and thoughts and options with no limitations. Stick them on the wall to organize and prioritize them. Cultivate curiosity. Ask questions. Read something new. Learn a new word every day. Vary your patterns. Take a new route to work. Find a way to do things differently. Find a way to see things from a new perspective. Share your thoughts with others. None of us are as smart as all of us. The exchange of thoughts and ideas with others can create a connection that leads to creativity that we might miss by flying solo. Start a Doodle Kit. A doodle kit is a great tool for encouraging creative thinking. My kit has some pens with cool ink colors, some sticky notes, a notebook, highlighters, a Kindle and whatever book I am currently reading. When I read, I often jot notes in the back of the book or magazine. These become the inspiration for new ideas. What are three ways I can begin to move out of old thinking? Would you like to have a free copy of 10 Keys to Unlock the Creative Thinker Inside You? Just send an email to terrydnewberry@bellsouth.net to request your free copy! This entry was posted on Sunday, August 14th, 2011 at 10:09 am	and tagged with change, Creation, creative thinking, Innovation, inspiration, Leadership, motivation, Out of the Box, Thinking and posted in Uncategorized. You can follow any responses to this entry through the RSS 2.0 feed. I cannot tell you how many times I have thought of an idea (maybe an improvement on someone else’s idea) and did nothing about it only to find years later someone else had the same thought and did do something. These kinds of things lead to a life of regrets.